For all of those who haven't heard Marc Ducret's Tower series, now is maybe the time to start. This record represents the last instalment of an incredible journey through many musical territories, yet with one musical thread tying them together, that of Marc Ducret's original musical thinking. Tower-Bridge is the fifth, and supposedly last part of the series (see below) which took as its inspiration Vladimir Nabokov's novel Ada. There are copious liner notes - as liner notes throughout the various volumes - which give some explanations to the connection between the music and the book, but for this short review it is suffice to quote the Ayler Record's presentation which states, "[t]he music [is] composed to convey Nabokov's text complex structure and writing process"¹. Although I reviewed several albums from the series - digital versions sent by Ayler records - so I haven't seen the covers. However, I did get a hard copy of this latest record. I'll mention the music shortly but the packaging of this disc merits a detour. The album is made up of double CD, with triptych folding sleeve, a small booklet with extracts from Nabokov's Ada, and an interesting fold-out with some notes from Ducret - which include a score of his composition Real thing #3. A last bonus is quite a crowd draw, access to exclusive video content, a 23 minute film by Sylvain Lemaire titled Tower in the Mist. I won't tell you what's on the film, after all that would only spoil the surprise! So, what can I say except buying a 'physical' copy is well worth the money. The music on the album is taken from two live concerts recorded in Strasbourg in 2012, producing around a 100 minutes of music over the two CDs. Like the previous albums, this recording re-examines pieces from the 'tower' series. An example such as sur l'électricité (tk1 CD1), has been presented in two formats. The first time was on volume two with Tim Berne: alto saxophone; Dominique Pifarély: violin and Tom Rainey on drums, along with Ducret on guitar. 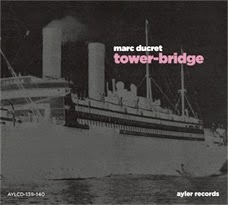 The second time was on volume four (an excellent album), where Ducret performed a selection of these pieces in solo format on acoustic guitar.² The appeal of Tower-Bridge lies more in the extended performances of these pieces, and of course the line extended up that performs them. The musicians, 12 in all, are the sum of all the albums in the series, forming a sort of mini big-band. This produces plenty of sparks and some fine music with powerful solos supported by tight ensemble playing. If you haven't heard Marc Ducret's music before and you're open to rock meets free-jazz meets Zappa meets contemporary classical music, then you'll love this. There's plenty of dynamic interaction between the musicians. Ducret has a knack in providing action-packed pieces, his rhythmic concept often develops around tight interlocking contrapuntal lines to produce long melodies which have a logic of their own. He also loves to use dissonance as a tool, combining it with rhythm in a powerful combination. There is so much on this record it would be impossible to delve into each piece. A few highlights include Tim Berne's inimitable alto leading the way on sur l'électricité (tk1 CD1). This track has a lot of information, a great theme, and plenty of muscular interludes with several gripping solos. The fantastical atmospheres conjured up in Real thing #1 (tk2 CD1) builds around a succession of duet/trio sections leading gradually to feature for the violin of Dominique Pifarély. Track 3 (CD1), real thing #2 has a wonderful strident solo from Kasper Tranberg (trumpet) who manages to ride over the heavy rocking ensemble, punctuated by powerful piano chord clusters. Softly her tower crumbled into the Sweet Silent Sun (tk1 CD2) flies out of the speakers like an angry neighbour shouting. The final track of the album L'Ombra di Verdi (tk3 CD2) produces a mysterious theme in the closing half which hangs somewhere between a film noir theme and a 6/8 rock ballad. What else can we say about such a great record? I guess that if you haven't heard Ducret before this is a good place to start, there's fine compositions and performances all here. And, if you like this then you'll need no encouragement to look into his work even further. As for Marc Ducret fans, if you haven't got this one, buy it! The website says this is a limited edition of 1000. Here's a video of the group live. The recording is more 'centred' sound-wise, but here you get some idea of the groups sound, and size. If you look for Ducret's Tower-bridge project on Youtube you'll find plenty of other examples. ¹ http://www.ayler.com/marc-ducret-tower-vol-1.html, accessed Sept. 6, 2014. ² It's interesting to add that volume four is the only record that has pieces unique to that record. There are a few pieces which are re-examined from the other volumes, however, tracks: From a Distant Land; Sisters; Ada; ... A Distand Land; Sybil Vane, and Electricity (by Joni Mitchell), are to be found only on this album.